There are few things better in life than warm, buttery bread fresh out of the oven. 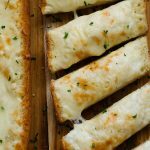 These Garlic Parmesan Breadsticks are that and then some! There are few things better in life than warm, soft, buttery bread fresh out of the oven. It is by far one of life’s greatest pleasures! 🙂 These breadsticks I’m sharing today are really the best ever. They’re so soft and delicious, and the garlic bread seasoning tops them off to total perfection. 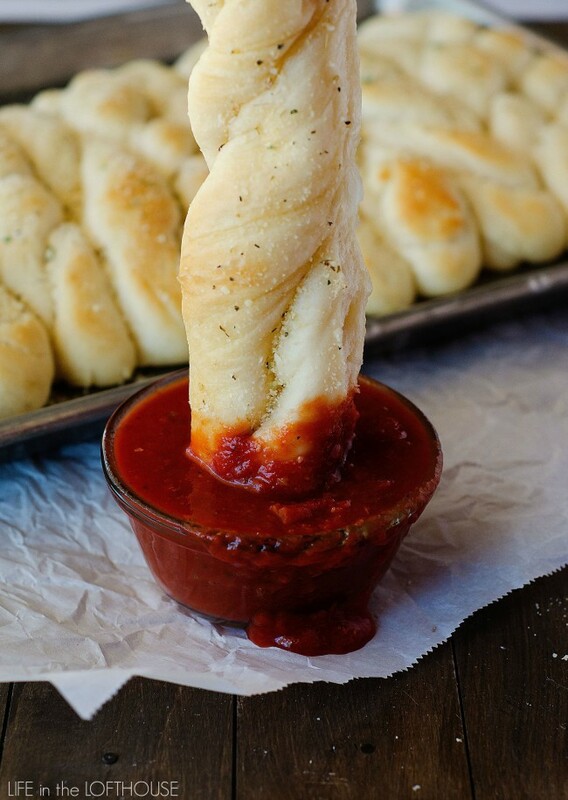 I love how easy this breadstick recipe is. Only 5 ingredients and hardly any rise time. They are basically fool proof. Seriously. I think the only thing that could mess these up is over-flouring the dough, so be careful on that! Less is more 😉 I love to make these breadsticks anytime we have spaghetti for dinner, or really any time I have an excuse to make them. 😀 We’ve also tried these without the garlic seasoning, and topped them with cinnamon and sugar instead. SO. GOOD. It is the ultimate treat! 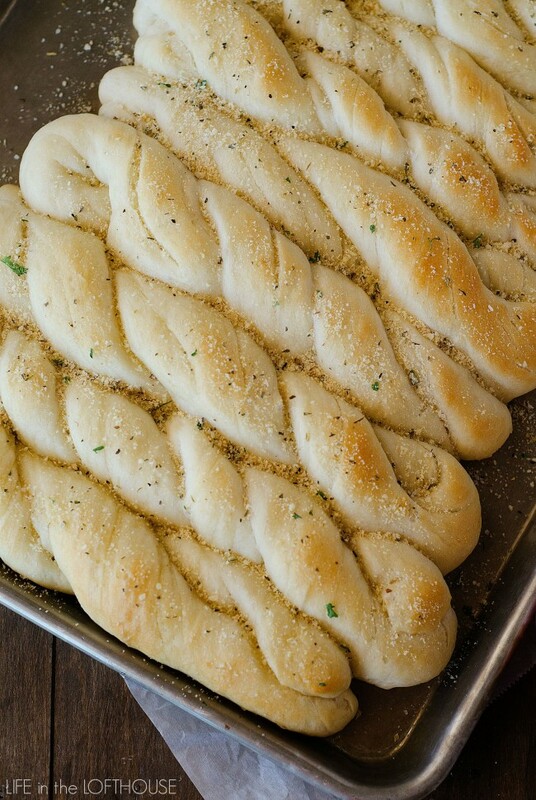 Soft, buttery breadsticks topped with a garlic Parmesan seasoning. These really are the best breadsticks ever! Cover bowl and allow to rise 30 minutes or until doubled in size. Remove dough from bowl and place on a clean and lightly-floured surface. Spray a large baking sheet with non-stick spray. Roll dough into a large rectangle, about 1-inch thick, and cut into 12 strips with a pizza cutter. Roll out each piece of dough into a long rope then twist. Place dough twist onto prepared baking sheet and repeat with the rest of dough, placing side by side on baking sheet. Cover and let rest 30 minutes to rise again until doubled. Preheat oven to 425° F. Bake 10 to 12 minutes or until golden-brown. Remove from oven and rub a ½ stick of butter over the warm breadsticks. Sprinkle tops evenly with Garlic Bread Seasoning! Click the link below this recipe card for Garlic Bread Seasoning recipe. This recipe was good, but I think to make it better would be to drizzle olive oil over the breadsticks and cook the breadsticks with the garlic parmesan mix over it. It kind of tasted bland when I made it, so I think I will try that next time and see how it goes. But I will try it again. It was very easy, and the breadsticks thickened right up. Try this, makes them real tasty. When they first come out of oven…melt 2 T. Butter with 1/2 t. Salt and 1/4 t, garlic powder and brush on bread stick then sprinkle with Parmesan cheese. 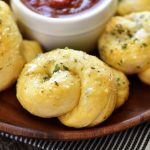 Pinned these breadsticks last week and I made them last night. They are by far the best breadsticks I’ve ever eaten! 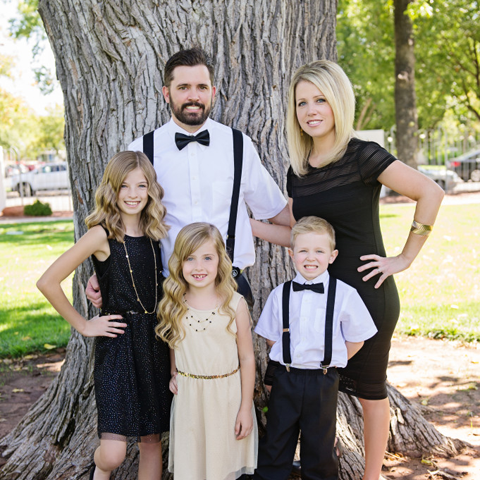 My family loved them too! I will definitely be making these again very soon! Thanks for the recipe! Hi I was just wondering if I can make the dough, shape them and then freeze them to make bake them the following day. I just made these with dinner and they were delicious! My son and husband grabbed them and gobbled them up. It seemed to make a lot so I saved the other half to make the cinnamon and sugar bread sticks. Thanks for sharing! 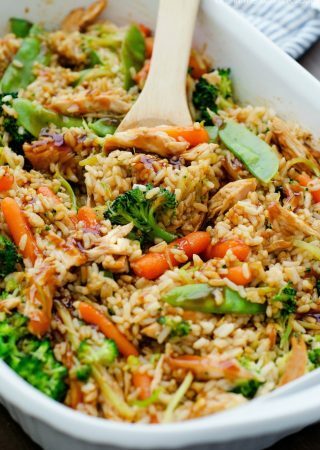 Could this recipe be converted to GF? If so how? 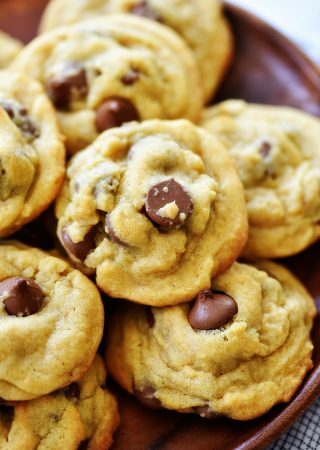 I just made these tonight and they are delicious!! Thanks very much for sharing. These looks awesome! Thanks for sharing the recipe! These look awesome! Thanks for sharing the recipe! I made these and they r so amazing that I wanted to make them for my daughters wedding in December. Because I need to make about 300 I was wondering if u have ever pre made them and frozen them for later? If so, do u freeze them as a dough or bake them first ? Hi Holly 🙂 I made these again today and this time I followed your suggestions! AND WOOOH! They turned out GREAAT 😀 Thank You so Much for this recipe and i LOOVE your website! Can’t wait to try out your other recipes. Can the bread sticks be frozen? And best before or after baking? Can I use pizza yeast? I brought it from the US here to India and we can’t easily get instant yeast here I don’t think. Why didn’t my dough rise? I used fresh instant yeast packets I bought at the store today and used the correct temperature of water. I added the right amount of everything. Put it in a warm room. So frustrating. This is why I don’t try things like this. It always seems to fail on me. Always put sugar on one side of bowl and salt on another. Then just mix right in with flour. Sometimes salt will make your yeast ineffective and not rise. Not sure if that was your problem though. Try again!! Try this when you make bread….dissolve sugar n warm water in a measuring cup gently sprinkle and stir in the yeast once it starts to expand dump in a mixing bowl, add half the flour then the salt then gradually stir in rest of the flour and let rise. I’ve found when you add the yeast, sugar and salt and water all together the salt seems to kill the yeast. This always works for me. Excellent recipe! I used my Bosch mixer and mixed it for 2-3 minutes after all ingredients were incorporated. I left the dough just barely sticky and let it rise in the oven for 45 minutes or so. Then just cut them into straight sticks but after those rose then I put a crease down the middle of them drizzled a garlic butter sauce in the crease and added chopped jalapeños in the crease and sprinkled with parmesan cheese. Baked for approximately 17 minutes. Then added more butter sauce all over them. Unbelievably delicious!! They had a good crusty bottom but were light on top. Glad they were such a hit! I love that you added jalapeños. Great idea! These breadsticks are delicious. I baked 6 and rubbed garlic butter over the top while warm. The remaining 6 breadsticks I baked them in a 250 deg. oven for 15 mins. (You don’t want them to brown). Cool completely & wrap & freeze or refrigerate. Reheat @ 400 deg until golden – about 10 mins. Taste fresh, very good. 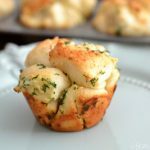 I made these and they were delicious with the garlic bread seasoning! I did a couple things differently, I didn’t twist them and I lathere’d them in butter then sprinkled the seasoning on top before I put them in the oven. So delicious! Ok… I did this recipe today and it’s totaly awesome!!! Easy as 1,2,3. Thanks for sharing this wonderful treasure. I made these tonight with some pasta with vodka sauce and they were delicious. I tweaked it a little by brushing on some Phase butter (shoutout to my husband for bringing it home from work) and the sprinkled on the topping before baking. When making the topping I didn’t have oregano but I did have some red pepper flakes so I added in a little bit of those and some fresh cracked black pepper and it turned out really well. They are so good, huh! Our family’s favorite. So happy your family loves them too! I made tgese today and they turned out simply delicious and yummy looking!!! My family LOVED these and I did too! Delicious! I made these tonight and they turned out great! It’s a little cold out and low humidity down here in Texas right now, so I had to bake 15-20 minutes. Definitely adding this recipe to our weekly rotation. They were the perfect addition to our Shrimp & Avocado Pesto Pasta dinner. Thanks for posting! You can make them the night before right up until the last rising step. Cover them with plastic wrap and place in the fridge. At least 4 hours before baking set them out on the counter to rise. Then bake as normal! Hope you enjoy them. These are my go-to breadsticks! I love this recipe! Even my picky kids love these bread sticks. Sometimes I make the dough and use it for pizza too! It comes out as nice as from a restaurant and much better than the frozen things. Thanks so much for sharing this. Thanks for this recipe! I made them to go with our Christmas spaghetti dinner and they were really good! Hi. 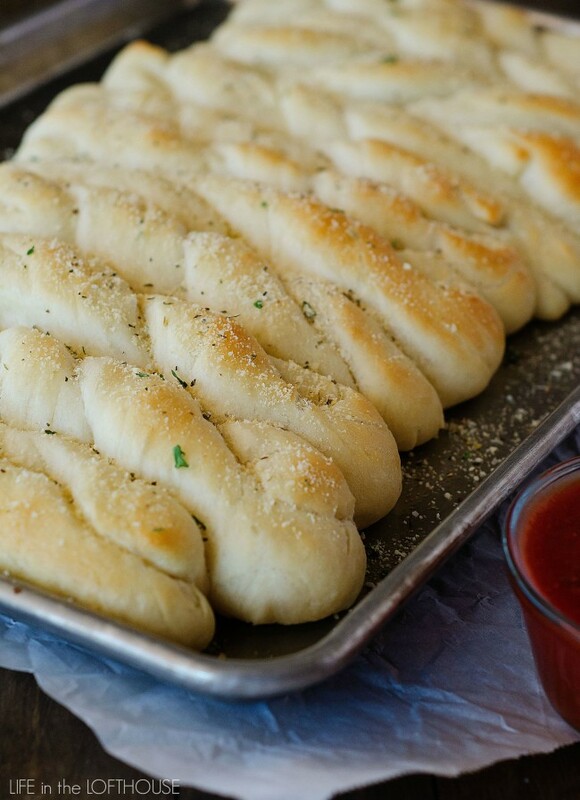 I made these tonight to go with dinner and they are seriously the BEST breadsticks. I have tried many recipes and these truly turned out amazing. Thank you for your recipe. I do have one question would these be able to be frozen and if so which stage would you recommend freezing them at. Again, thank you for this recipe.